I ripped two long strips of walnut and the rounded them with a spoke shave. The spoke shave really works fast. It is the first time I have used one on hardwood. The veritas one I have is great!! 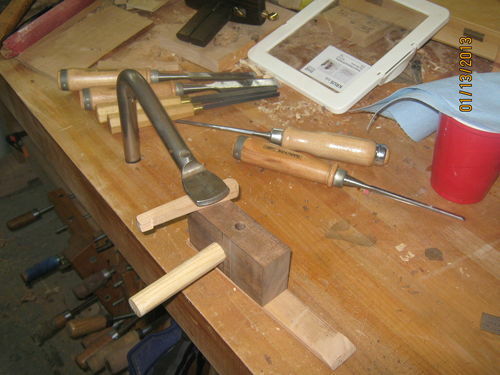 Now I’m chopping the wedge mortise one #5. You can’t reall see it but there is a retangular hole in the side of the gague. 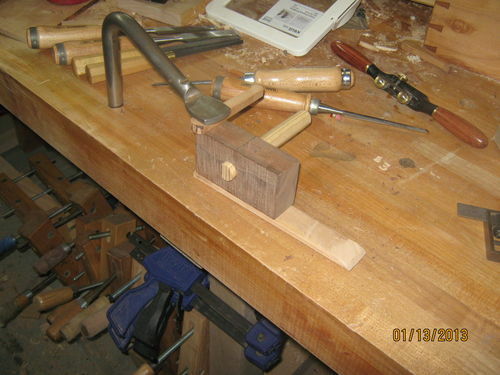 The round waste dowel is to minimize blow out as the mortise is chopped. Looking good! I appreciate your writing this up, I plan on making a couple of marking gauges in the near future. Good blog, I can see many wanting to make one of these. Thank you for the encouragement. I really appreciate it. Due to my posting errors #2 got before #1 so it is out of order but ….. I’m learing.